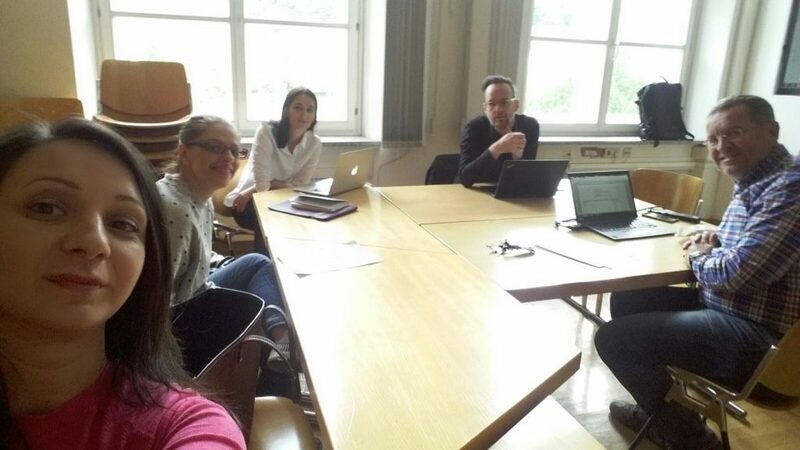 While the preparation for the start of the first PoSIG academic year is on the way with the new students coming to Salzburg to kick off their master, the EuroPS consortium set up a working group to develop new project applications. This is envisaged in the framework of the WP10 Dissemination with the aim to prepare Jean Monnet Network, Jean Monnet Module and Erasmus+ CBHE project applications for 2017-2018. Such efforts will ensure increased sustainability of the current EuroPS consortium and joint master, but at the same time will enable staff and students from partner universities to benefit from capacity development and mobility opportunities. In addition, it will open up the possibility to expand the reach of the consortium to the entire Western Balkans region and beyond. The project coordinators from the European University of Tirana, Ss. Cyril and Methodius University in Skopje, Sarajevo School of Science and Technology and under the auspices of the University of Salzburg met in Salzburg from 11 to 15 September to prepare the project applications. The Project Leader, Dr. Franz Kok, will visit partner universities in the Western Balkans at the end of September to finalize all reporting and management issues of the EuroPS.